The dusty streets of the town were littered with the detritus of abandonment. Rathgar pulled the hood of his cloak up to shield his head from the brutal rays of the sun. "Alms, please sir, alms" the emaciated man begged, his voice dry and cracking. Rathgar looked down upon the wretch, barely clad in rags that hung as loose upon his gaunt frame as his skin. Within his cracked clay bowl rattled a single copper drot. With barely a thought Rathgar opened his coin pouch and reached in. Glancing back at the beggar he caught a dark gleam in his pale eyes that sent a shiver down Rathgar's spine. He swallowed his rising gorge and dropped a mixed handful of coins into the bowl, the gleam of platinum, gold, and silver sparkled up at him. "Bless you" the beggar croaked. As Rathgar moved along he heard the beggar call out to the few other passers by. A short time later, after Rathgar had passed out of sight, and the coins long gone from the bowl, a merchant kicked at the beggar as he passed. "Get your filth off my street. There is nothing for you here." The hungry man smiled a cadaverous grin, and the merchant's chest convulsed with pain. 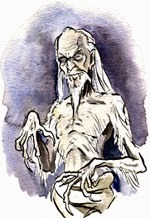 The Fear Gorta is a spirit of famine that appears as a nearly cadaverous man or woman. While chaotic, it rarely attacks indiscriminately, and will give it's targets a chance to avoid it's wrath. Anyone who appeases the spirit will have a +1 bonus to any roll, once per day. Anyone who refuses to give alms and is struck by the creature's gaze will suffer a -2 to all attack rolls, AC, and physical skill checks/ability checks. If physically attacked the Fear Gorta will respond with it's own claws, for 1d6 points of damage, and 1 point of Constitution score damage. Each point of Constitution damage can only be healed by a remove cures spell. I offer the Fear Gorta, a spirit from Irish myth for you on St. Patrick's Day!